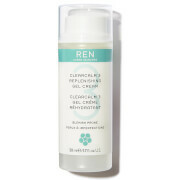 REN ClearCalm 3 Replenishing Gel Cream is a soothing gel-cream facial moisturiser and blemish treatment formulated to leave oily, irritable and blemish-prone skin replenished, comfortable and calm while combating the appearance of blemishes and breakouts. This lightweight gel-cream will eliminate and regulate excess sebum, clear skin of dead cells, and prevent blemish-causing bacteria. After use skin is replenished, comfortable and calm, and the appearance of redness and pigmented scars are reduced. At the heart of the formula, licorice extract helps to reduce the production of oil, whilst an essential oil complex reduces inflammation. Active Ingredients: Alpha-Linoleic Acid, Japanese Liquorice Extract, Essential Oils Complex. REN CLEARCALM 3 Replenishing Gel Cream 50ml was found on 4 websites and was price compared using EAN: 5060033770818. The cheapest REN CLEARCALM 3 Replenishing Gel Cream 50ml is shown as the main item, prices range from £29.00 to £29.00, excluding delivery. Price comparison based on price and delivery charges, with any valid discount codes being applied, is shown in the table above. Prices and information correct at the time of publication.